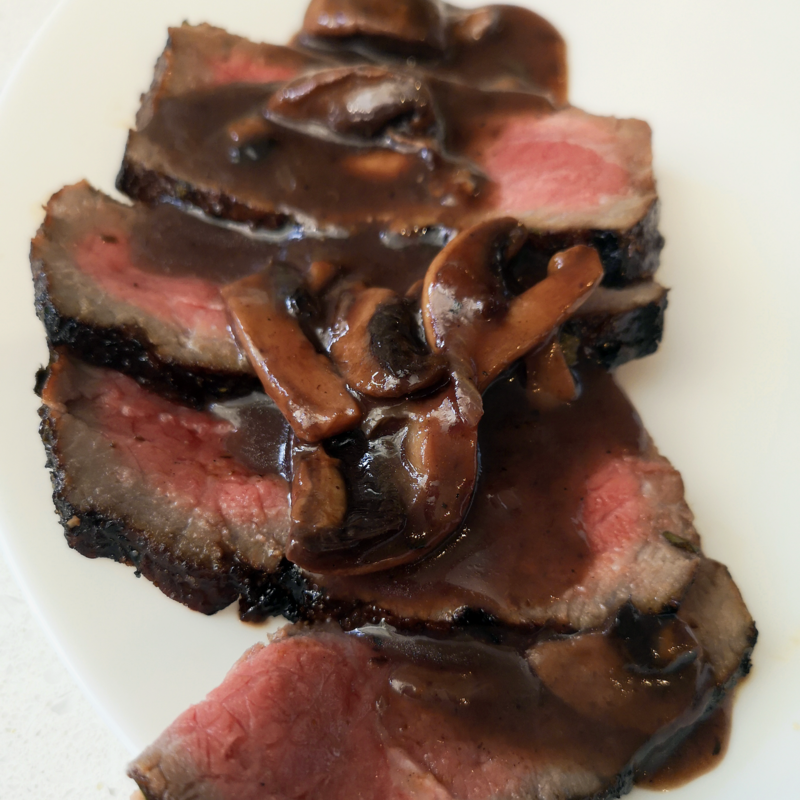 I saw a recipe for mushroom sauce made with red wine in the The New Professional Chef: Culinary Institute of America cookbook, and wanted to make some for the london broil I was cooking. The sauces in the cookbook can be quite labour intensive, making jus de veau (french for veal stock), then making jus de veau lie (basically veal stock thickened with arrowroot), and then making the mushroom sauce itself. So I cheated a bit, saving some time. I used beef bones and made my own stock, and then used half that stock to make my mushroom sauce. Basically combining the jus de veau lie and the mushroom sauce recipes. It’s a very rich sauce and goes well with beef. I think it would be very nice with duck or pheasant, as well! Melt the butter in a pan on medium heat, add the mushrooms and onion. Saute until the mushrooms are brown and the onions have turned translucent. Add a splash of stock to deglaze and then add the remaining stock. Add the oregano, thyme, and bay leaves, bring to a boil. Turn down the heat to medium and let simmer for about 5 minutes. Add the wine and bring back to a boil. Turn down the heat to medium and let simmer for 5 minutes. Add 2 teaspoons of arrowroot powder that has been mixed with a bit of cold water. Whisk in and bring back to a boil. Turn down to medium heat and let simmer for 5 minutes. If the sauce has not thickened, add arrowroot powder (mixed with a bit of cold water), 1 teaspoon at time, bringing back up to a boil each time and then turning down to medium. Once it begins to thicken, add the mushrooms and onions back in. Add a few dashes of worcestershire sauce, and taste for addition of salt and pepper. Let simmer until desired thickness. Serve over slices of London broil.